Had VM 100Mbps service installed for over a week now and setup a TBB monitor on my ip. 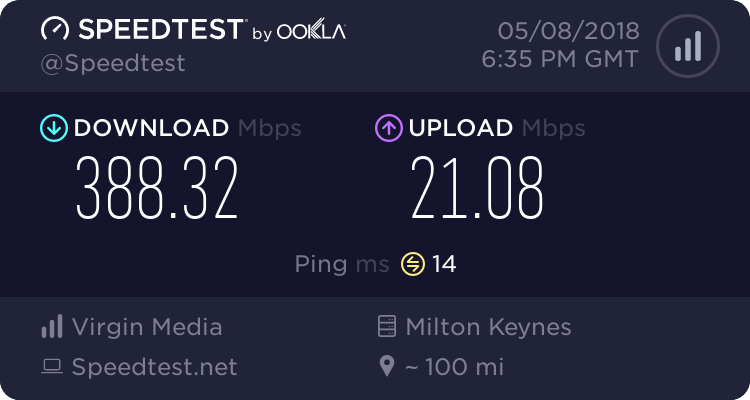 The latency looks wild on my connection, this defo doesn't look right does it? Superhub 3 and the joy of the Intel Puma chipset, i.e. delays and low priority in responding to pings. Thanks for the reply Andrew, so is this a normal graph for a superhub 3 VM user then? Looks normal to me, welcome to VM and the SH3. Not a lot you can do on this. That's how Hub 3 graphs used to look, but the Intel Puma issue was resolved in a new firmware patch several months ago. The graph should look much better now. Login to the Hub and select Admin, Info, and check the firmware version. It should be 9.1.116.608. Very surprised MrSaffron didn't think to mention there's an updated firmware that fixes the issue. It was rolled out to users on the top tier many months ago, not sure if it's been rolled out to all users yet. Thanks for the responses everyone, just checked the firmware version. Sadly that the bad one.... You could try contacting customer support. Also when I got the initial update, it seemed to only update in router mode not modem mode. Mine updated fine in modem mode. I was initially on Vivid 200 as 350 was not available at first, when I changed to Vivid 350 it updated immediately.